It has been a few weeks since my last plein air exercise, and this time I had some great company: my dad, who is also a designer and artist. We went out in his garden for an hour in the cool afternoon, and found some nice points of interest where the light came through. I like his garden because there are a fair amount of small views to take advantage of. It’s like a small scale park. I picked a corner of the pergola he built emerging in view between an exbury azalea in front and a mass of trees behind. I have found that I am often attracted to the interplay of man made structures and natural growth, and this was a good small subject to get at that. Since finishing the large white house painting, I have worked with more confidence. I am not sure that it shows in the final result, but the time to get there and the feeling while painting was very different. It was also nice to get back to a smaller work–this was about 5×7–and not worry much about washes. 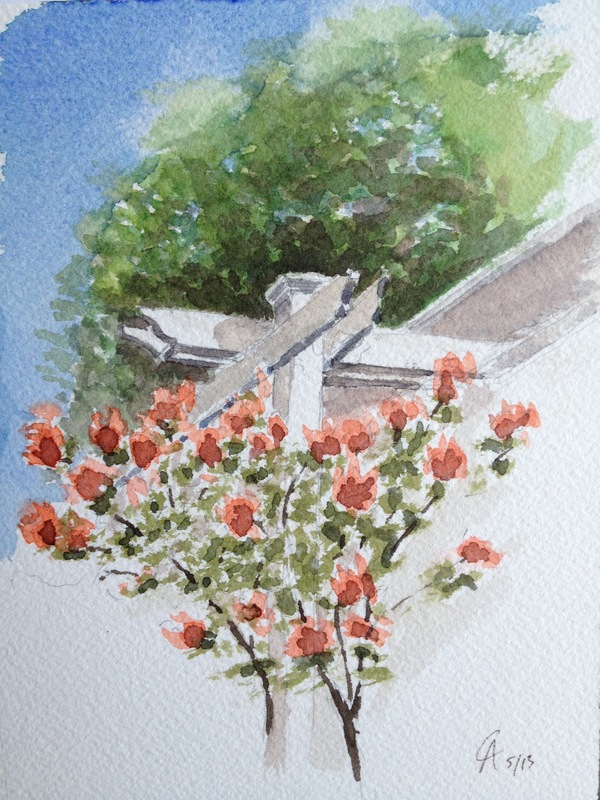 I used a mix of ultramarine and Prussian blue for the sky, quinacridone red, permanent yellow deep, and burnt umber for the flowers, and variations on all those colors with a little Pthalo green for the foliage. Burnt sienna and ultramarine gave me the warm and cool shadows. This palette was a bit of a hybrid between the White House painting (mostly Prussian blue, quinacridone magenta, permanent yellow deep, and Pthalo green), and what I had previously been using, and I find it’s a pretty comfortable blend. There is more I could do with this to make it stand out some more, but I want to show what I did outside before I clean it up further inside. I am still working out a visual language for myself and thinking about a more unified series to pursue to help me get stronger with a few things, but I think I am getting closer with these experiments. Superb plein air piece, Corey. I love it! Your intersection of the man-made structure and nature reminds me of what I tried last year painting in the Fort Worth Botanical Garden. In fact, I used a wooden structure much like what you used, and then put the cut-stone column beneath it, with all the botanical growth surrounding it. I really enjoyed that experience, and can tell that you did this time as well. I’ll be interested in following this “visual language” series that you’re contemplating. I’m on the same kind of venture right now too, not sure of what it’s going to be exactly or where it will lead. But it’s nice, having the future “open” like this, the dizzying freedom of exploring and creating art. Thanks for putting your work and words up here for us to see and draw inspiration.